A unique collection of 1028 natural products for high throughput screening (HTS) and high content screening (HCS). • J Chem Inf Model . 2017 Sep 25;57(9):2099-2111. • Cell . 2018 Oct 4;175(2):442-457.e23. • Immunity . 2018 Jul 17;49(1):80-92.e7. • Blood . 2018 Jul 19;132(3):307-320. • J Am Chem Soc . 2018 Nov 28. • Adv Sci (Weinh) . 2019 Jan 20;6(5):1802057. 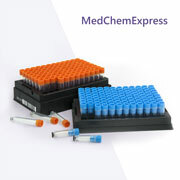 • A unique collection of 1028 natural products for high throughput screening (HTS) and high content screening (HCS). • The compounds in the library contain Saccharides and Glycosides, Phenylpropanoids, Quinones, Flavonoids, Terpenoids and Glycosides, Steroids, Alkaloid, Phenols, Acids and Aldehydes. • A useful tool for drug discovery as an important source of lead compounds.